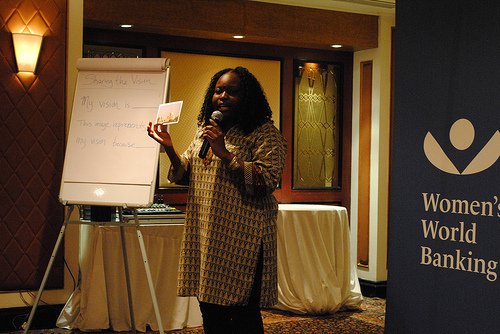 In November 2013, I experienced one of my most defining moments as a Women’s World Banking Fellow. I found myself immersed in the vibrancy of Mumbai with speakers from the Citi Foundation, facilitators from Women’s World Banking and leaders – existing and budding – from the financial services sector. I was in the midst of an ecosystem of partners committed to gender diversity. Together with women leaders from across the South and Central Asia regions, I developed, articulated and committed to a leadership vision. As each woman stood to share her vision, I observed a collective consciousness and commitment to developing women as leaders and as clients. Attending a Women’s World Banking’s Women in Leadership program was an honor and a privilege that has been extended to each of the Women’s World Banking Fellows, preparing us to become future leaders in microfinance and women’s economic empowerment. Participating as a Women’s World Banking staff member demonstrates Women’s World Banking’s commitment to building inspirational leadership based on values and strategic thought and action. My participation in the program was a much needed exercise in self-reflection, an expansion in self-awareness and an opportunity to proactively define and launch my leadership journey. Time management: One very important thing I have learned is that pushing back with managers is not a sign of weakness or an indicator of failure; instead it is something that is respected. With some anxiety, I recently practiced this and to my surprise, my manger thanked me for doing this. Handling difficult situations: As an emotional person, I have to constantly be aware of how I communicate with people. I am now intentional about communicating with the people in the exact way that would expect them to respond – respectful, thoughtful, confident and purposeful. Building relationships: During the program, we identified actions that we should take to build on strong relationships, change difficult relationships and foster new relationships that can help us achieve our leadership goals. As part of building relationships – and inspired by the program – I started a sisterhood circle, bringing together women from across the African diaspora to discuss career development, relationships, finances and other key issues related to our personal growth. We hope to hold our first meeting next month. The Program facilitators served as coaches, guiding us through practical exercises and advising on real life experiences. Paired with another woman leader, we took walks with each other and told stories of the difficulties we faced in our jobs, as leaders and while being led. The most incredible and powerful part of the program was the visioning exercise that wrapped up five full days of leadership training. Drawing the whole week together, we reflected on everything we learned and by doing so, were able to identify our leadership goals and the key steps we needed to take to achieve them. At the end of this exercise – everyone was glowing with a true sense of purpose – I know my head was certainly held higher. I didn’t have to wait long for the program’s impact to make itself evident—the very next week, I was asked to speak about our leadership programs at Women’s World Banking’s best practices conference in Amman, Jordan. I viewed this as a great opportunity to practice my newly found leadership skills. It was exhilarating and terrifying and absolutely worth taking the risk. I don’t think I would have presented with such ease and confidence had I not just returned from the program—it truly allows you to see potential and greatness in yourself that you were not previously able to see. It helps you to think so clearly and intentionally about the direction you want to take in terms of developing your career and being a solution for your institution. 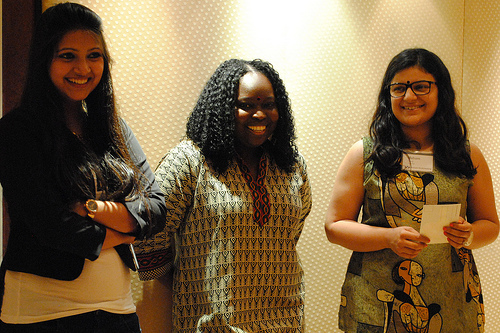 Through this program I have gained a network of counterparts from the South Asia region. There is even talk about potential exposure visits to each other’s organizations! I have an accountability partner from Sri Lanka – we exchange emails regularly to share the opportunities and challenges we face in achieving our leadership visions. Together, we celebrate small wins such as maintaining a healthy work-life balance, pushing back when necessary and welcoming unfamiliar challenges. I continue to remain in touch with the larger group of participants through “Whatsapp” and through Women’s World Banking’s online leadership community. I am immensely grateful to Women’s World Banking for giving me the opportunity to participate in such a transformational program and to become connected to a wide network of women leaders. I leave the program with so much more clarity on where I want to be in the next few years and beyond and perhaps more importantly, the steps to help get me there.